Every now and again, a little maintenance work on any computer, tablet or smartphone device is necessary to help keep it performing at the top of its game. For example, running an anti-virus, spyware or adware program every other month will certainly help you fend off some of the Web’s non-niceties. But even so, you cannot expect optimum performance if your storage is almost completely maxed out, and Clean Master for Android is one of those infinitely useful apps which scans, locates, and eradicates any unnecessary bulk which may be slowing your device down. More details can be found right after the jump. There are plenty of apps within this category, although Clean Master is among the best in its field. It presents itself in a clean, decluttered interface to match its motif and purpose, and is incredibly easy to get started with. You’ll be able to see just how much space you have used / remaining on your device (as well as any SD cards you may have installed), and by checking for overly bloated caches attached to some of your installed apps, you can readily identify and delete anything you deem to be a waste of space. As well as allowing the user to manually clear caches and free up space for more important stuff, there’s a novel, automatic option, and you can also check for those straggling files still hanging around for apps you’ve already deleted. Most people would think that, once an app’s removed, all traces have been dumped along with it, but seldom does this turn out to be the case, so it’s always to have an app like Clean Master in place to ensure you can quickly and securely get rid of them. It’s absolutely free of charge, so it’s worth checking out via the Play Store link below on a no-risk basis. 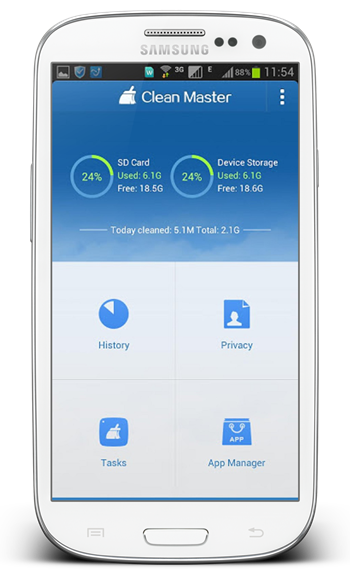 So, if you feel like your device is running out of space but aren’t exactly sure where it’s all going, give Clean Master a try, and let us know how much space you saved in the comments section below.